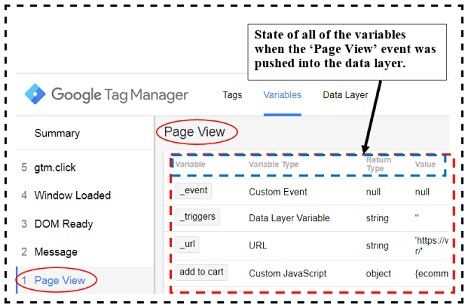 Through Google Tag Manager preview and debug console window, you can make sure that your tags, triggers, variables and data layers work as expected. By default, what you actually preview and debug is the deployment of the current container draft on your website. You preview and debug the container draft on your website, as if it is currently deployed. When you enable the preview mode, the GTM preview and debug console window appear at the bottom of the page. This page needs to have the GTM container tag installed. Note: The preview and debug window is currently not available for the mobile apps which contains the mobile app container tags. The appearance of this notification banner is a proof the GTM preview mode is enabled. Step-1: Navigate to the web page on your website where you want to preview and debug the deployment of the current container draft. 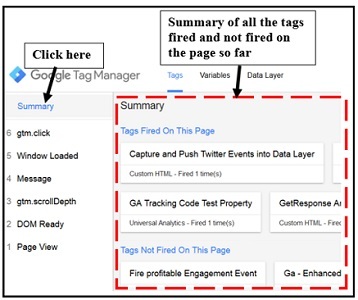 Step-2: Enable the preview mode within the GTM user interface (as explained earlier). Step-3: Navigate back to your web page and then refresh it by clicking on the browser ‘refresh’ button. Note: Just enabling the preview mode within the GTM user interface won’t automatically enable the preview mode on your website. You would also need to refresh your web page. Once you refresh the web page, the debug console window should disappear from the bottom of the web page. 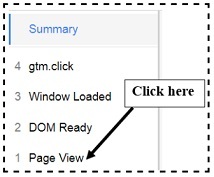 Note: Everytime you enable / disable the preview mode from within the GTM user interface, you should refresh your web page. 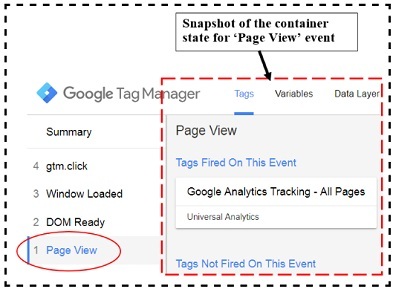 By default, whenever you enable the preview mode in GTM, you preview and debug the deployment of the current container draft on your website. But you also have the option to preview any previous version of your container. Note: Version is the saved snapshot of your container. Step-3: Click on the ‘Preview’ link to enable the preview mode for the chosen container version. In our case, the chosen container version is version 49. Step-4: Navigate to the web page on your website, where you want to preview and debug the chosen container version. Once you have enabled the preview mode, navigate to the web page on your website, where you want to preview and debug the deployment of the current container draft. You should then see the debug console window at the bottom of the page. 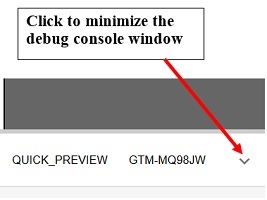 Note: The debug console window will appear only to you and not to your website visitors or other users of your GTM account. 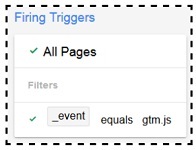 Everytime, you make changes to any tag, trigger or variable in your GTM container, you should update the preview and debug mode. 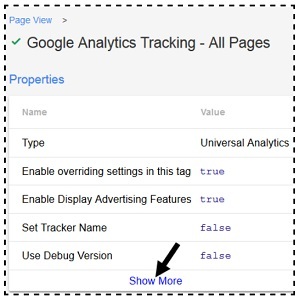 Make sure that you have updated the preview and debug mode in GTM before you update the preview and debug mode on your website. In order to update the preview and debug mode on your website with new information, simply refresh the webpage (by clicking on the browser ‘refresh’ button) where you see the debug console window. 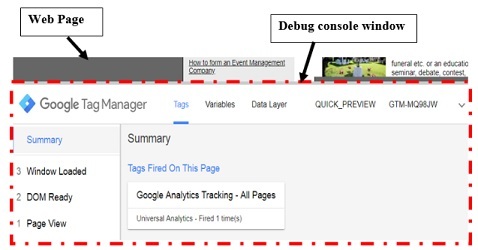 Once you refresh the web page, the debug console window should update with new information about your events, tags, triggers, variables and data layers. As you navigate through the previewed web page (the web page which shows the debug console window), the debug console window can also automatically update with new information (even without any browser refresh). This is more likely to happen, if you are tracking events (like scroll tracking, video tracking etc) on the previewed web page. The events are listed in the order they were pushed into the data layer. 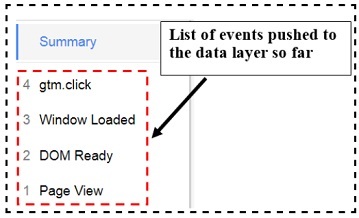 #1 ‘Page View’ event was pushed first into the data layer. #2 ‘DOM Ready’ event was pushed second into the data layer. #3 ‘Window Loaded’ event was pushed third into the data layer. 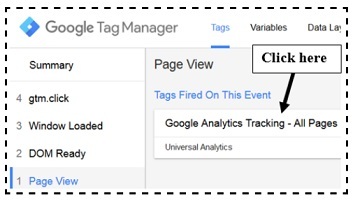 #4 ‘gtm.click’ was the last event pushed into the data layer. You can click on an event name in the event list. When you click on an event name in the event list, you see the snapshot of the container state during that event. This snapshot is, what the current container draft looked like, in terms of: tags, triggers, variables and data layers when an event was pushed into the data layer. Whenever you click on an event name in the event list (of the debug console window), you see the snapshot of the container state for the selected event. From the last three screenshots above, we can conclude that the ‘Google Analytics Tracking’ tag fired only once and that too when the ‘Page View’ event was pushed into the data layer. This tag did not fire when the ‘DOM Ready’ and ‘Window Loaded’ events were pushed into the data layer. 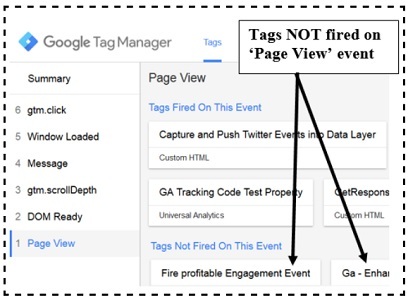 Do not expect your tags to be fired for each and every event pushed into the data layer. Similarly, do not expect your triggers and variables to be resolved for each and every event pushed into the data layer. At the top of the event list in the ‘Summary’ button. Click on this button whenever you want to see the summary of all the tags fired and not fired on the web page so far. Click on ‘Show More’ link to see the full list of properties. So if a certain tag does not fire for a particular event, you can click on the tag, scroll down and check the ‘Firing Triggers’ section. That’s how through debugger console, you can determine the reason of a tag not firing. 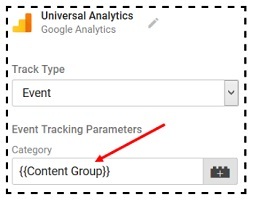 #1 All the built-in variables you enabled via the GTM user interface. 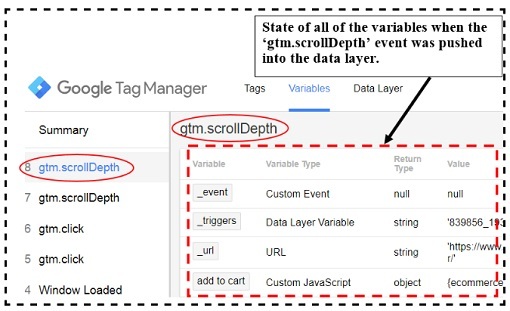 #2 All the user defined variables available in your GTM container. Note: In order to make your debugging easier, enable only those built in variables which you really need. Additionally, delete all those user defined variables which you no longer use. Just like tags, a variable can have a different state (return type & return value) for each new event pushed into the data layer. Do not expect your variable to retain their state for each new event pushed into the data layer. 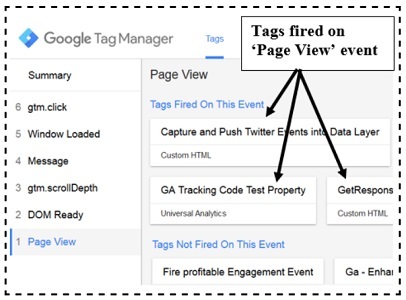 The preview and debug mode evaluates all of the variables configured in your GTM container tag for each event pushed into the data layer. So each variable can be evaluated (and sometimes even resolved) multiple times. 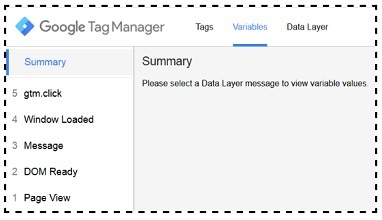 But not all the variables configured in your GTM container tag will resolve for each event pushed into the data layer. If a variable does not resolve for a particular event then it means that any tag that fire on that event will not have access to the value of the variable. So it is important to understand that if you want to use a variable then it must resolve (return a value other than ‘undefined’) when the event that triggers the tag is pushed into the data layer. 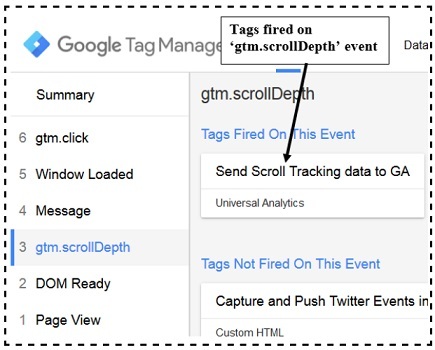 For example, the scroll tracking variables must resolve when the ‘gtm.scrollDepth’ event is pushed into the data layer. Otherwise your scroll tracking will not work. You need to select an event from the event list on the left, in order to see the current state of all of the variables. #1 the state of the data layer when a particular event fired. #2 the state of the data layer after particular event fired. This setting can come handy if the debug window is becoming visually obstructive. Click on this icon to bring back the debug console window. 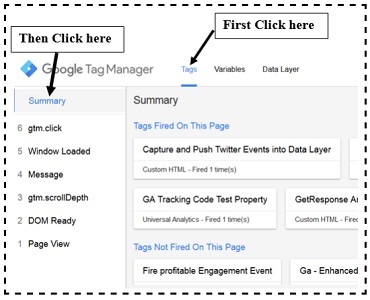 Step-1: Enable the preview mode within the GTM user interface by clicking on the ‘Preview’ button. 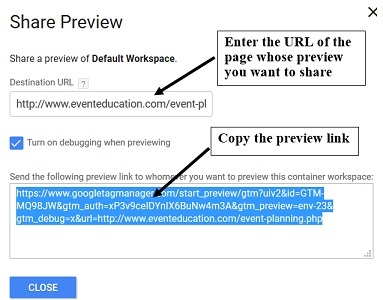 Step-4: Share the preview link with whomever you want to preview your web page. Once the person starts previewing, he should see the debug console window at the bottom of the page. He will see the debug console window despite being logged in to your GTM account. This is the advantage of sharing the preview mode. 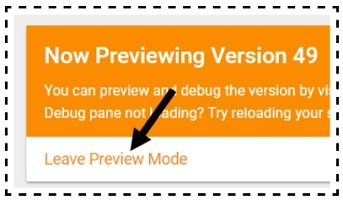 If the preview mode is not enabled in GTM then it won’t enable on your website either. Just enabling the preview mode within the GTM user interface won’t automatically enable the preview mode on your website. You would also need to refresh your web page. Otherwise the changes you made in your GTM container may not reflect in your debug console window. If you are using a caching plugin and/or CDN (content delivery network) that automatically cache website contents then you may need to do ‘hard refresh’ on the webpage where you want the debug console window to appear. The hard refresh should bypass the cached content. 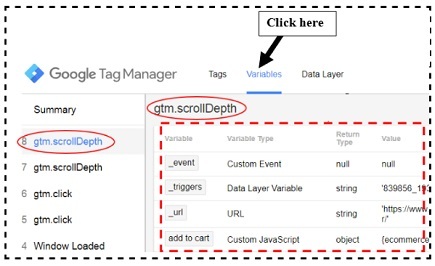 In order to minimize caching issues, avoid using the ‘Refresh’ button in your GTM account, everytime you make changes in your container tag. 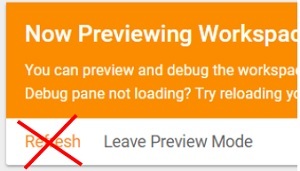 Instead click on the ‘Leave preview mode’ link, make necessary changes and then click on the ‘Preview’ button. If you are planning to make and test lot of changes in your container tag and your website is so heavily cached that you need to do multiple refreshes in order to see changes in your debug console then temporarily disable your caching plugin and/or caching feature in your CDN. You need to disable cache so that your browser does not keep loading the previous version of your web page while you are making changes to it for testing purpose. Your testing could become really hard, if you can’t see the changes you are making. 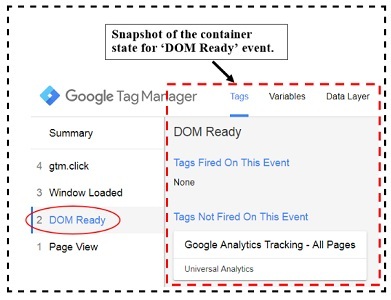 Check the source code of the web page (where you want to see the debug console window) to make sure that the GTM container tag is present. 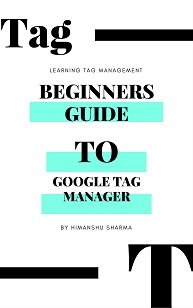 This container tag is the same code which is used to install Google Tag Manager on your website. Without this container tag, the debug console window won’t appear on your website. 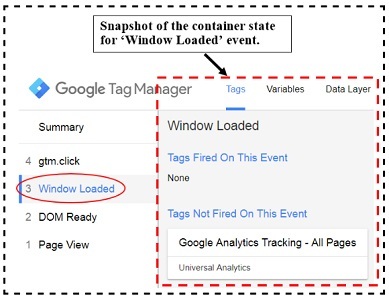 Check the Google Tag Assistant to make sure that the GTM container tag is firing on page load. Sometimes the tag may not fire even when it is hard coded on your web page. And whenever the container tag does not fire, the debug console window won’t appear on your web page. 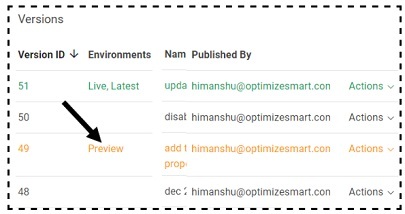 If you have got access to multiple GTM accounts then there is always a possibility that you accidentally enabled GTM preview mode of a container which does not match with the container code hardcoded on the website. 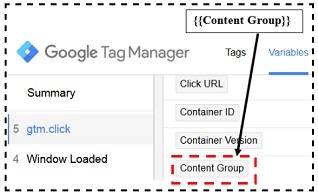 Note down the container ID from the hard coded container tag on your website and then compare it with the container ID you see within the GTM user interface. They both need to match. #10 Make sure that both your website and GTM account are opened in the same web browser. Otherwise the debug console window will not appear on your website. #11 Make sure that both your website and GTM account are opened in the same privacy mode. For example, if your GTM account is opened in the incognito mode then your website should also be opened in the incognito mode. Similarly, if your GTM account is opened in the regular (non-incognito) mode then your website should also be opened in the regular mode. 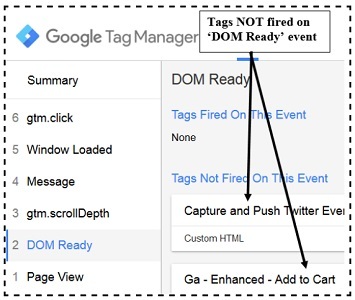 Sometimes a browser extension can stop GTM container code from getting fired. And whenever the container code is not fired, the debug console window won’t appear on your web page. The browser extensions which are most likely to stop GTM container code from getting fired are ad blockers (like Ghostery, AdBlock plus etc). If you are not sure which browser extension is causing problem then disable them all and then enable them one by one. Sometimes browser default or modified privacy settings can stop the debug console window from loading on a web page. This could happen when the 1st party and/or 3rd party cookies have been disabled in your web browser. Make sure that your browser accept cookies esp. 3rd party cookies. 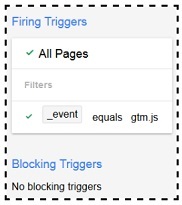 Sometimes website firewall settings can stop the GTM container code from firing. Contact your web developer and make sure that it is not the case. If everything else failed and the debug console window still does not appear on your web page then clear all your cookies, cache and history and restore your browser settings to default or better re-install your web browser.